Smart Facilities Management from enLight® from Gary Atkinson on Vimeo. From energy efficient car parks to a smart sensory network across your site. 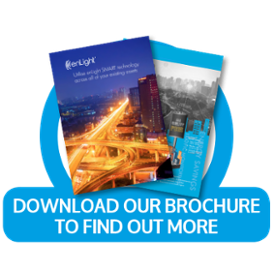 Download our Smart Facilities Brochure to learn more. enLight provides a cost effective smart facilities management solution for an integrated and fully networked environment, through the power of existing lighting infrastructure. Most buildings and campuses have external lights surrounding them or running through them and by deploying the enLight lighting platform, a low power network is created that can be used for all sorts of sensors and actuators. However, you are not just limited to external devices as the network has the ability to penetrate deep inside buildings and connect to a whole host of indoor and/or industrial sensors. In this way, the data can be pulled out of the building and there is no need to negotiate with the tenant to use their IT network. The productivity of tenants is directly proportional to the environment in which they are working and the quality of the air is an important factor in the wellbeing of staff and visitors. Vehicle movements and footfall counts are important metrics to ensure campus roads and car parking are adequate and that pathways and connections between buildings meet the tenants’ needs. A smart meter per building is pretty common but measuring consumption at a floor, room or asset level is often too expensive or complex but doing so can significantly aid energy reduction programs. It is a lot easier with an enLight platform. Tracking meeting room and hot desk use along with shared space utilisation are key metrics in tracking optimum space usage, as well as maximising revenue for building owners if the building is multi-tenanted. Low-cost thermal imaging and motion triggered lighting, in combination with directed CCTV, can greatly increase protection at both the property boundary as well as at entry and exit points. Most induction motor energy sensors cannot tell if the rotor is spinning resulting in catastrophic failure. enLight’s motor sensor monitors energy consumption, temperature, vibration and rotational health to trigger preventative maintenance. Aside from the general ambience for tenants, there are many other areas that are subject to preferred humidity control and leak detection such as plant rooms, server rooms, storage areas, toilets and distribution cabinets. Early detection is much cheaper than failure. A standalone business case for any one of these would normally have trouble getting financial approval as on their own, they often do not justify the investment in the network needed to enable them. By upgrading the lights outside, the energy and maintenance cost reductions provide a return-on-investment of fewer than 4 years so that each of the use cases above can be “layered” on with no significant capital investment – save the cost of the sensors/controllers themselves. Have you considered implementing Smart infrastructure? Do you find the technological advantages offered by such systems attractive but the costs prohibitive? Is monitoring every aspect of your business sites becoming an increasing concern? Find out how enLight’s intelligent systems enables your organisation to deploy these effective monitoring solutions to whilst reducing your overall energy costs. Our technology is already being trialled by a major UK urban council and has been implemented by a number of market leading private enterprises across multiple sites. One of the driving forces behind this adoption is enLight’s experience in this sector, which has allowed the continual refinement of our implementation model to work with any location on a world-wide basis. Discover now how you could access the power of enLight’s systems. Understand how enLight can help you to maximise the potential from your existing assets? WHY SHOULD YOU USE ENLIGHT? Unlike many of our competitors, enLight has the power to deliver complete end to end smart facilities solutions, which consist both of the devices necessary for effective monitoring and the networks to power them.